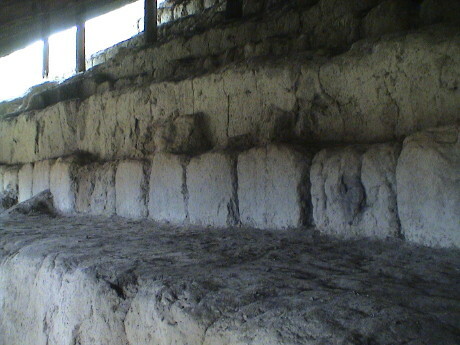 Today, the group took a field trip to Cochasqui, a site with pre-Inka terraced pyramids. it is not known exactly what went on on these flat topped pyramids, but the reasons could be ceremonial, religious, astrological or just about anything else. The existing structures just look like dirt mounds now with an obvious ramp leading up to one edge. This is what we are looking for at Loma Sandoval but our site has been modified by bulldozer in recent times and doesn't stand out nearly so clearly. The shapes of the pyramids are still pretty clear, even after 500 years. Most of them have nothing inside, all the action apparently happened on top. A few have burial chambers in them. There are also many older rounded burial mounds on the site. 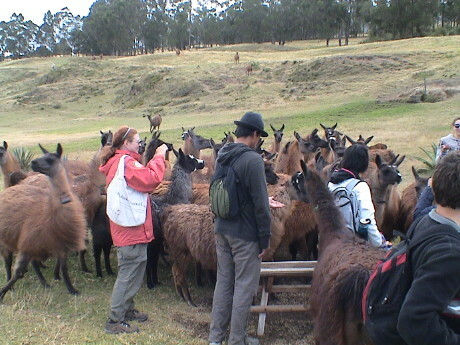 The site is also well stocked with llama and this is the reason why. These two are busy making little llamas. Some of the mound edges have been excavated revealing Cangahua block terraces around the pyramids. We hope to find something like this at Loma Sandoval. 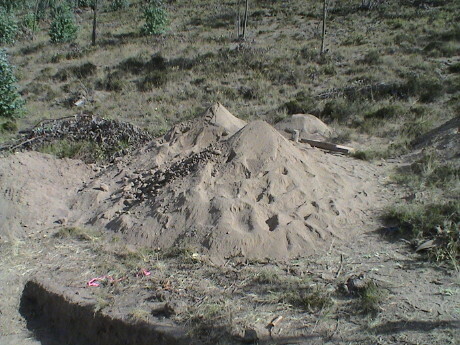 The rest of the pyramids are filled with dirt with the tops covered in baked clay with signs of postholes indicating that wooden structures were built on top. 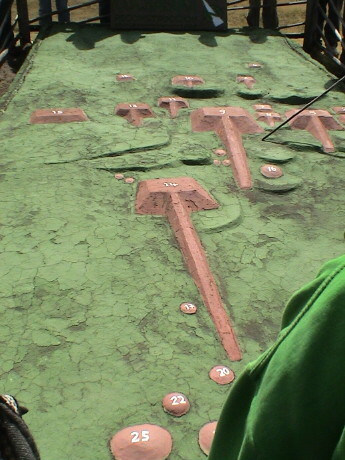 Some of them also have trench like features that might have any number of uses. 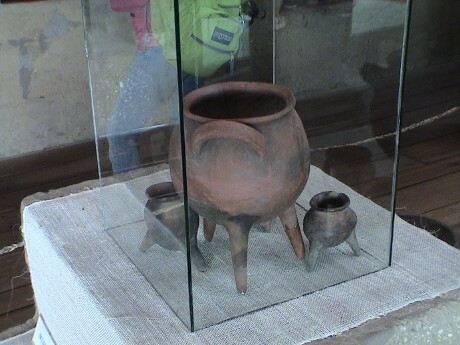 This is a sample of a three-legged pot that was uncovered at Cochasqui. We've been finding pieces of pots like these all over the Molinoloma and Loma Sandoval sites, but nothing that is even nearly whole. As we were leaving the site, the llamas started to migrate over to where we were, apparently expecting a handout from us in the form of salt. The whole bunch must have come over. It was not obvious while we were touring the site how many that there were. Maybe a third of the total show in this picture. Somebody brought a salt shaker. 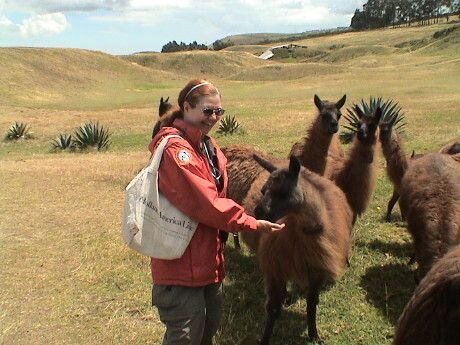 Sandy put some in her hand and a llama was happy to relieve her of it. She was squealing like a little kid as the llama was helping himself. One the way back from Cochasqui, I was watching the fuel prices. Premium is basically $2,05, regular is $1.55 and diesel is $1.05 per gallon. I originally thought that the prices were per liter but Ecuador is an oil exporter and fuel is relatively cheap here. 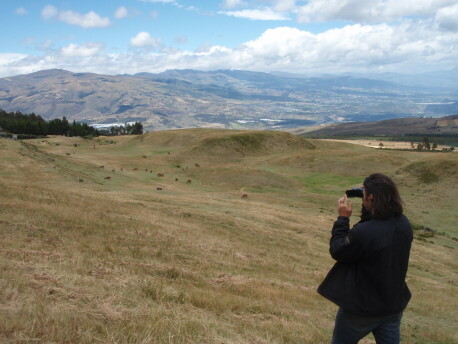 We got off the bus in Cayambe and again went to the Gran Aki to buy some supplies. The bus terminal is only a couple of blocks from the Gran Aki and we figured out that if you get on the bus ready to leave, you'll be standing. This time, we waited for a new bus to come in and unload and then quickly got on before it filled so that we got seats near the front and didn't have to stand and then work our way through the crowd to get to the front to get off again. This is the hot setup if you are not in a hurry. The drivers basically wait at the terminal to absolutely fill the bus to SRO capacity before they start their trip. You either get a seat and wait or get on a bus ready to leave and stand. The weekend is over and it's back to work. Sandy worked on ArcGIS in the lab all day. 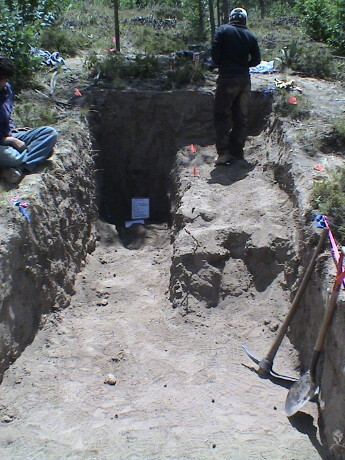 I went back to Loma Sandoval to do more digging. This is Kalli working on unit 4 trying to find a terrace wall. We didn't find it. However, the formations in the shadow that the directors thought might be the wall were proved not to be. The stuff was just compacted dirt and once wet, it just falls apart. It would not have withstood a single hard rain, much less 500 years in the weather. However, at unit 3 about 10 meters away, they did find what appears to be part of a wall. It might even be a corner. If we project that row of stones back to our dig, we'd have to dig 4 more meters (in the direction away in this photo) and go quite deep to find it. Since my back won't let me pick axe or shovel for long I spent all morning carrying buckets of dirt excavated from unit 4 to a dump pile 6 or 7 meters away. We didn't sift this dirt as we expect that all the artifacts found don't have much context anyway as a lot of dirt had been moved to bury the site and the artifacts moved along with it. The Ecuadorian worker that we hired to do this for us didn't show up. After lunch, I moved to unit 1 which was a search for residential structures. That unit turned out to be a bust. Nothing of interest was found so that the unit was closed. 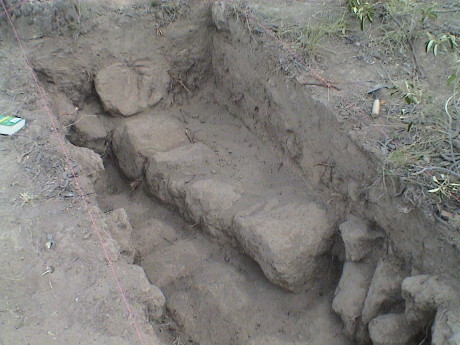 Instead of digging more in unit 1, a new unit, unit 5, was opened just uphill. 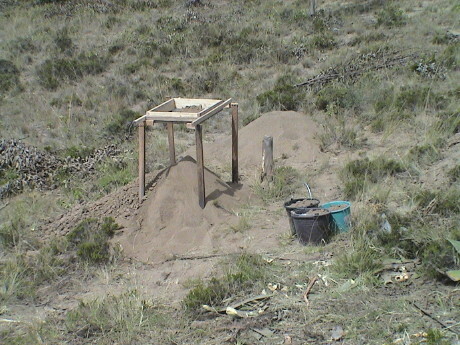 This unit is a 1 x 4 meter cut through a mound. The mound started as an agave covered lump. 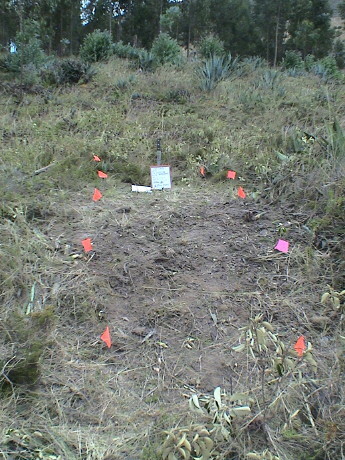 The other Ecuadorian worker we hired did show up and he made short work of the agave with a pickaxe. We started digging that unit shortly before quitting time. We're not sifting there either, so the back dirt is being carried in buckets to a pile about 10 meters away. It can be sifted later if it is deemed necessary. We had more people that could fit in the little pickup trucks at the site so it took two loads to get all of them up and down again. Chad needed the truck during the day so that we shuttled the truck back and forth. I drove the last load back and I came home dirty and tired. Last night, I spent some time on Google Maps and Google Earth trying to find a better satellite image of the Hacienda. The road that the Hacienda is on isn't even on the maps, nor is the town of Cangahua. 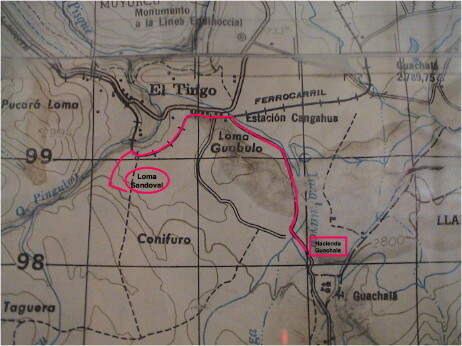 Even after finding the area where the Hacienda was in the satellite images was not fruitful as the area is covered in clouds. The actual location of the Hacienda is a little northeast of the pin in the lead photo. Today, I was back at Loma Sandoval trying to find the terraces around a temple. We didn't find them today. 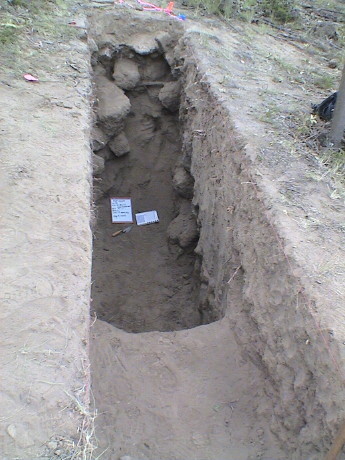 Instead of digging the whole unit out, we elected to just dig to the back in half of the unit. This is the unit closing photo. That back wall is about 1.5 meters high. I think that we have to push the wall back another 4 meters before we will find the steps but I am pretty sure that we will actually find them after a significant amount of work. In unit 3 down the hill a little ways, they found another row of steps and some signs that there might be TWO structures, one of much rougher construction covering the other. To continue pushing into the area of the terraces, we opened another unit tacked on to unit 4. This is unit 6 at the surface. It is 1 meter wide by 5 meters long. We'll cut a trench up to 2 meters deep at the back until we find something.... or not. As we were breaking up the surface of the first 3 meters of unit 6 to a depth of 15 cm or so, Kalli spotted this artifact laying in the dug up dirt. It is probably Inca although there is some opinion that it may be pre-Inka. 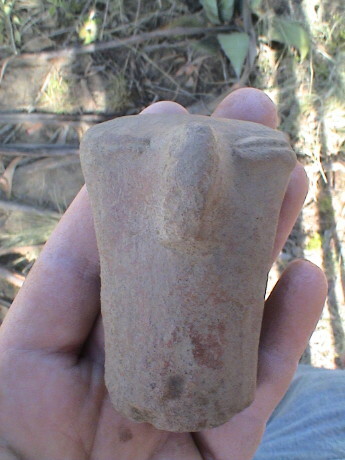 We believe that it is a stylized llama head that is broken off some larger piece of pottery. Features like these were often attached at the top of a pot to allow a rope sling to be tied to the pot. Sandy spent the day in the lab working on ArcGIS. She has been able to convert digital elevation models of Ecuador that she found on the internet to a raster format and display them. The project REALLY wants her to dig into this stuff so that she has been relieved from digging duties and assigned to the lab. She says that she is liking this arrangement a lot. In the meantime, I'm out in the field getting really dirty. The weather today was pretty much like every day. It varied between hot and sunny to cold and windy with periods of rain scattered in between. There were also periods of overcast still air, then the wind would pick up for a while and then die again. These changes can happen every few minutes. Today was much the same as yesterday, I was at Loma Sandoval and Sandy was in the lab. These are the "steps" in unit 3 that we are trying to find in unit 6. We haven't found them yet though. Since my back won't let me pick or shovel I've been working the screen most of the day. Initially, we weren't screening for artifacts. 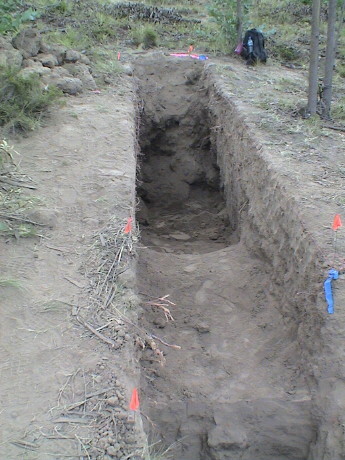 The excavated dirt was simply piled up awaiting screening later if it was deemed necessary. But since we found the ceramic llama, the plan changed. We screened ALL of the dirt from unit 6 including that which was piled yesterday. This picture was taken early in the day before we had much of a dirt pile. By the end of the day, the pile was huge. We had to pull up the screen legs several times to raise the whole assembly above the pile. We also had to hoe out the pile to spread it out several times. Normally, screening is the holdup. We run out of buckets to excavate more dirt so that the excavation gets held up. However, we worked out a method using three people that ran much more quickly. Two people worked the screen and a third "bucket manager" refilled the screen with a new load as soon as the screeners determined that there was nothing more to find. The bucket manager would also collect any artifacts found and put them into the appropriate bags while the screeners were working the next load. This kept the screeners in place, undistracted and busy. We also applied the "don't sweat the small stuff" rule where we would shake out the dirt that fell through the screen and then examine the result for a maximum of 5 seconds. If a potential artifact was not large enough to be seen in that time, it was discarded too. Doing all this stuff allowed us to keep up with the diggers. We recently got eight new screens made by a carpenter up in Cangahua. They cost the project $15 for all eight of them, materials and labor. We need some new legs too as these four were the last ones I could find and they were in the worst condition. By the end of the workday, this is what unit 6 looked like. We still haven't found the steps at the end of the unit but we may have another half a meter to dig assuming that the steps actually extended this far. About mid day today, we opened a new "level" in the unit. A level is defined when there is a soil change. This indicates that the stuff above is probably different from the stuff below. In our case, the change was that the soil became more compacted and somewhat harder. We still hadn't found a continuation of the stone wall from unit 3. By quitting time, our dirt pile had grown very large. In the morning, we broke down and spread the pile from yesterday to allow a larger working surface on top. We set up two screens, hence the two peaks of dirt. The second screen allowed the screeners to work at a more sane pace and still keep up with the diggers. When we quit for the day, our "pit of despair" was about 2.5 meters deep, well deep enough to expose the wall if it was there. We can only conclude that the wall probably doesn't extend as far as our unit, at least in the same form. However, we were still finding pottery, some in pretty big pieces, all the way to the bottom. It took all morning to "clean up" and close unit 6. The final trench is 2.2 meters deep. It might seem odd to have to clean up dirt, but procedure calls out for well scraped vertical walls and no debris on the floor. We also had to map the walls, that is to draw 1:20 scale drawing of any features, such as rocks, that are left in the walls. This is because on Monday, we are going to extend the unit 2 more meters to the west, but only about 1 meter deep. I've been going to Loma Sandoval for over a week now and this is the route that I've settled on to get there as I was driving many of those days. I go north toward the Pan American Highway, but I turn on to the old railroad right of way, which is now a good dirt road, for much of the distance to avoid having to drive on the highway and all the crazy drivers there. 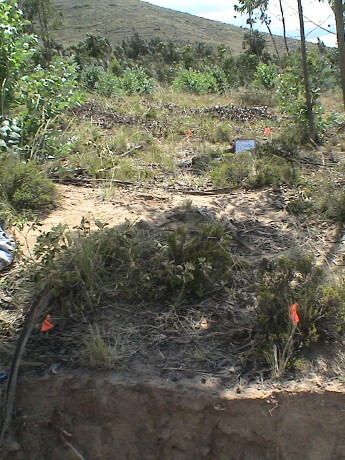 We get to a deep ravine and then turn up a poor dirt road to the south west corner of the site. The barbed wire fence is down there so it is easy to get onto the site. We have permission to be there. The crew then walks down the hill a little ways to the various unit locations. This coming weekend is a weekend off so that folks can go off on sightseeing trips. Students can only go places that senior staff is going too. There are three trips on the schedule, one to a city of Mindo on the costal side of the Andies in the low level rain forest, one to a city even further up the coast, Puerto Quito and one to back to Otavalo. Sandy and I are going on the Otavalo trip because Sandy wants to go back there to buy more loot. Further the other two trips are to malaria risk areas. We have the anti-malarial drugs but I'd rather not risk it. It will be an overnight trip this time. We are traveling light so that I don't expect to create another entry into this trip log until we get back.